HARD HAT 1015 Heat Resistant Coating can be applied on new, bright or shot-blasted steel or well pre-treated coated surfaces such as barbecues. HARD HAT 1015 Heat Resistant Coating can be applied on new, bright or shot-blasted steel or well pre-treated coated surfaces such as barbecues, boiler fittings, hot air cannons, exhausts, etc. Intended for small maintenance jobs and repairs. Rust-Oleum Industrial 2100 Hard Hat Topcoat Heat Resistant Aluminium 1015 is available in 1 colours from the Rust-Oleum Industrial Colour Cards. surfaces such as barbecues, boiler fittings, hot air cannons, exhausts, etc. Hard Hat® heat resistant coating is intended for small maintenance jobs and repairs. Hard Hat® heat resistant coating provides protection up to a dry heat of 750°C (short-term peak load) for applications indoors or in a sheltered outdoor environment. Surface Preparation: Clear of grease, oil, dirt, loose rust, loose coatings and any other contamination using suitable agents. Sand intact, old paintwork so as to obtain a good key. The surface must be clean and dry during application. Mixing and Thinning: The coatings must be stirred vigorously before use until they are thoroughly mixed. Do not thin Hard Hat® heat resistant coating. Application: Only apply if the air and surface temperatures are between 5 and 35°C and the relative humidity is less than 85%. The temperature of the coated surface must be at least 3°C above the dew point. Theoretical Coverage: 10-12m² per litre at 35-40 μm dry. Drying Times: (at 20°C/50% RH). Fully cured: 24 hours after the minimum service temp of 150°C is reached. Gradually heat the coating to 150°C (max. 50°C/ hour). 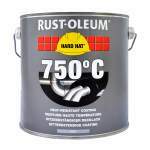 Clean Up: with RUST-OLEUM® thinners 7301.